In the world of digital storage, DVDs ruled the market for quite a while and are still a great portable. But it’s quite difficult to maintain DVDs as they are easily got scratched or damaged. So if you’re looking for a way to transfer/backup contents of your DVD collection into computers or flash drives. Then WinX DVD Ripper Platinum is the right tool for the job! 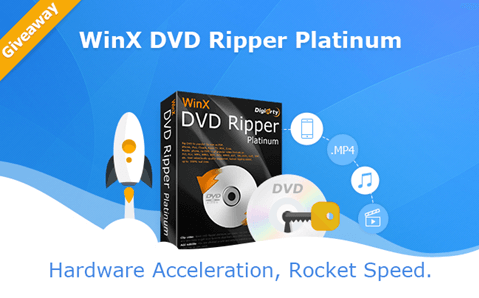 Today, we have a complete review of a powerful DVD ripper – WinX DVD Ripper Platinum here for you. We thoroughly tested the tool and hope that it can be useful to you, too. WinX can help you fast rip any DVDs, even copy protected DVDs, to almost any formats you want. The backup DVD full titles job only takes within 5 minutes via its amazing hardware acceleration technology. You may scroll down to the WinX DVD Ripper Platinum review below to learn features in details, or just grab a free license copy and try it yourself: Get WinX DVD Ripper Platinum Giveaway Version. Why Choose WinX DVD Ripper Platinum? 1. Boost DVD Rip Speed By Using Hardware Acceleration. 2. Supports All File Formats. 3. Rip Copy Protected (99-titles) DVDs. WinX DVD Ripper Platinum does a great job working with commercial/homemade DVDs. It has no obstacle to decode encrypted DVDs like 99 title DVDs, read scratched DVDs and workout DVDs. You can use it to backup DVDs onto your hard drive flash storage perfectly on Windows (10). Just follow 3 steps (loading DVD – choose profile –run), then you can enjoy the fast DVD ripping speed with its support for several acceleration technology. For output files, WinX lets you convert DVDs to ISO image files, DVD to MP4, AVI, WMV, MOV, etc video formats and portable media such as Android, iPhone, iPad, Windows devices, Sony and other brand gadgets. Besides, you can also choose about 350+ inbuilt profiles directly for backing up DVDs and creating rips. WinX DVD Ripper platinum is one of the only few DVD ripping software that support hardware acceleration. And WinX is more powerful than others for it not only utilizes Intel QSV and NVIDIA (CUDA) NVENC, but also supports Multi-core CPU and Hyper-threading. It greatly improves DVD ripping speed and helps in faster ripping, faster backups, faster DVD copies and much more. The WinX DVD ripping tools support all kinds of DVDs as well as output formats. You do not have to worry about the type of DVD that you want to rip because this tool supports all. Concerning about output formats, you can convert image DVDs to ISO files, convert all your movies to iPhone, iPad, Android and any video formats such as MP4, AVI, MOV and many more. There is no limitation on formats so the possibilities are endless. MP4 is a popular format which a lot of devices support, and you can find how to rip DVD to MP4 here. Many of our DVDs may have become older with time and been through a lot of wear and tear. The only solution is to create backups of your DVDs. With WinX DVD Ripper Platinum, you are able to create full size 1:1 completely lossless backup of your content. The process is fairly simple and you can either create full backups to ISO/ DVD folder with ease. WinX is offering giveaway for our readers. You can get a giveaway version or avail a huge discount on all products. With 10 years of experience in the industry, Digiarty is now a leader in personal and home-use video audio applications based on Windows and MacOS. It provides fast and easy-to-use DVD ripper/copier/creator, HEVC video converter, online video downloader, media player, iPhone file manager, video audio streaming app, etc.